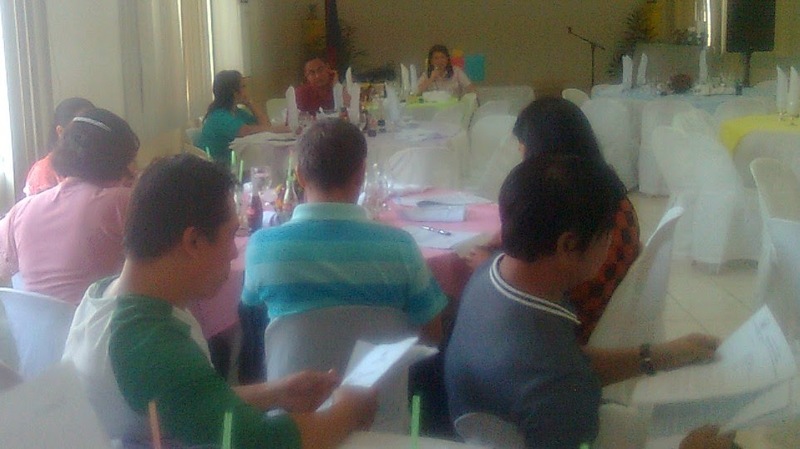 After tendering a luncheon meeting with the 13 Department of Education (DepEd) employees affected by the recent rationalization plan of the mentioned agency, La Carlota SDS Porita M. Mallorca led the schools heads in a thorough deliberation on the issue on hiring prospective qualified teachers. 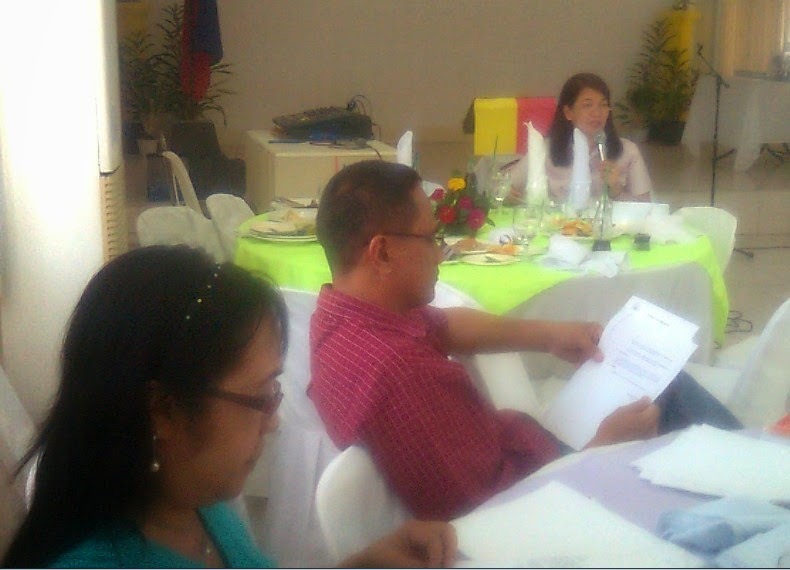 Schools Division Superintendent Mallorca in a verbatim discussions on the provisions stipulated in DepEd Order No. 14, series 2014 issued by Education Secretary Br. Armin A. Luistro, FBC dated 14 March 2014 said that the content of the said guidelines should be understood, questions or clarifications be properly attended to, that is, to avoid misinterpretation and to refrain from wrong generalization. 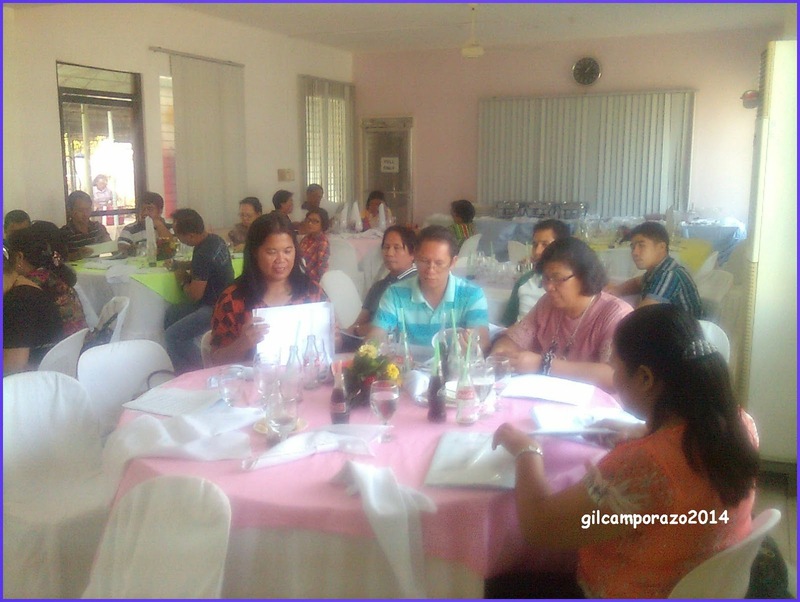 She noted that some of the provisions included in this order are favorable to the teacher-applicants especially the kindergarten teachers. This Order with enclosure of 17 pages so provides the guidelines on hiring teacher 1 positions for school year 2014 - 2015 and it should be implemented immediately. 1. Strict observance of DepEd Order No. 22, s. 2013 as the "Revised Guidelines on the Transfer from One Station to Another." 2. Regular school teachers wants to be transferred shouldn't be considered as new applicants. 3. DOST scholars applying for teaching positions in public schools should observe these guidelines. 4. Teachers who haven't practiced their teaching profession for the past five (5) years should take again twelve (12) unis in education courses in order to be considered as teacher-applicant. Ma'm Mallorca stressed that the so-called "last in, last out" principle should be observed in considering the application of teachers to be transferred to another station. Every teacher-applicant is required to submit his/her pertinent papers for evaluation. These may include CSC Form 212 (Revised 2005) with latest 2x2 ID picture, certified photocopy of PRC professional identification card, certified photocopy of ratings in Licensure Examination for Teachers, certified copy of transcript of records, copies of service records including performance rating and school clearance for those with teaching experience, certificate of specialized traning (if any), certified copy of Voter's ID, and omnibus certficaton of all documents submitted. Mallorca emphaszed that certification of these documents should declare their authenticity and veracity and they should be under oath, meaning duly notarized by a notary public. Any teacher-applicant may be found violating this provision should be charged according to what the law so requires. According to the order, the selecton committee in school level is headed by the school head with four (4) teachers as members. They are tasked to receive applications and documents, to verify and certify the documents, to make copies of the documents, and submit the list of applicants to Division Selection Committees. The division selection committee is composed of assistant schools division superintendent (ASDS) as the chairman with three (3) education program supervisors, PESPA president, and representative of civil society organization (CS0). 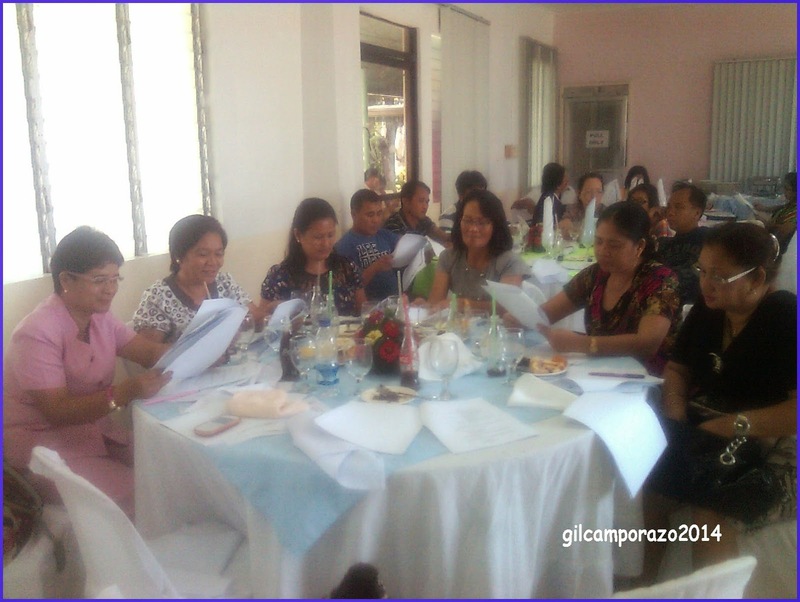 This committee tackles the function of receiving the list of applicants with their respective documents from the school screening committee, verification of the documents, evaluation, conduct of interview, observation and rating of teacher-applicants demonstration teaching, administration of English Proficiency Test (EPT), among others. In this recent guidelines of hiring teacher 1 position, teacher-applicant for kindergarten teaching assignment should be separated from the regular teacher-applicants. The division selection committee for elementary schools then shall prepare the separate RQA for Kindergarten teacher applicants. Kindergarten teacher-applicant must have degree in early childhood education, science in preschool education, science in family life and child development. They must not be more than 45 years old. They should pass actual demonstration teaching in kindergarten class. And as to their teaching experience, only teaching experience in kindergarten/preschool both in public and DepEd-recognized private schools could earn points. DepEd Order No. 14, s. 21014, otherwise known as "Hiring Guidelines for Teacher 1 Positions Effective School Year (SY 214-2015" should be used as the basis of determining the qualified teacher-applicants for the next school year, 2014-2015. The DepEd believes that with the full implementation of these guidelines, the primary objective of the K to 12 Basic Education Program be integrated and institutionalized. It does expect that the quality of education could be enhanced by hiring highly competent teachers by carefully observing the provisions of these guidelines. All these points are 100. By the way, this order has amended that DepEd Order No. 12, 25, and 37, series of 2012. DepEd Secretary Luistro ordered that this shall take effect immediately. And in complying with these guidelines, all the school heads and head teachers of the Division of La Carlota in a special meeting tackled these things to clarify doubts and to come up with a unanimously decision in applying these in the next school year. Given the following criteria, I can't judge if fresh grads can be given with more opportunities than those who already have teaching experiences. It's nice that DepED has this new guidelines that would both empower the teachers and also strengthen the education department. educators should really be well chosen in schools either public or private, particularly for the pre-school department, wherein the foundation of knowledge starts to establish. Experience is very important in teaching students because teaching is not a very easy. I guess it's okay to do this kind of evaluation because the future of the students also rely on teacher's ability to teach them effectively. This is a brilliant idea to know that they are focusing for the teacher's credibility. I like this new idea,hope it'll be helpful for both teachers and students. It's good to know that DepEd issued these guidelines in selecting teachers to hire. It's great that they are uplifting the quality of education here in the Philippines. I also hope that our teachers will be compensated well given the improved guidelines. Its nice to know that one of focus is teacher's credibility. Ang hirap po lang sa mga nagparank ng january..who undergone the whole procedure (demo, exam and interview) na uulit sa process and all..
Maganda po itong bagong guidelines.. pero sana they should have issued this before january.. it is a bit unfair to those who had already undergone the whole hiring process.. And then Deped will tell these applicants that they will AGAIN UNDERGO the procedures.. Nakakalungkot po kasi at parang nabalewala lahat nung January applicants..
You're absolutely right... this is what happening right now in our place. Teacher-applicants were already ranked early February and the results were finished and they're about to be posted in the bulletin board when this latest development came in. I think it should be implemented if it both favors teachers and students. Good day, Sir! I have been a Volunteer Teacher for the past two years. I'm on Category A rank #12 in the RQA in our District for S.Y. 2013-2014. I got 10pts for the Interview and 20pts (Demo Teaching). My point here is that, should I undergo the whole process again (Interview, Demo) even if I already got the highest score in the said criteria? I just want to take the English Proficiency Test again but my friend (who is also an applicant) said that we are all back to zero that's why we should undergo the whole process all over again. Kindly enlighten me with this one. 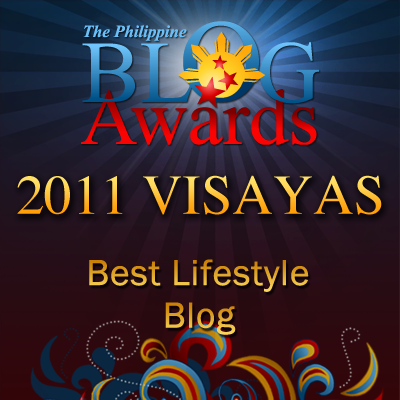 Thank you Sir, Mabuhay and God bless! This is unfair for us January applicants. DepEd should have posted this order last year so that we'll know what to do and to prepare, or better yet, not to have ranked this school year at all. It means we have to gain 3-5 teaching experience before we could decide to apply for teacher 1 position. This only favor to those who have teaching experiences.